Ensure that the finish of your instrument is kept in its best condition by wiping your instrument using a Maestro DRI Microfiber Cloth especially after every use. Sweat and oil from our hands that is introduced to your instrument may affect the finish in the long run. Instruments with Nitrocellulose finish are extremely delicate thus extra care is required. As sweat and oil from our hands may corrode even the string’s protective coating, wipe your fingerboard using a Maestro DRI Microfiber Cloth after every use to prevent rusting of the frets and strings. Wipe your instrument using a Maestro DRI Microfiber Cloth after every use to keep it in its tip-top condition. Do not subject your instrument to extreme force or weight. Even if it is stored in the case, do not drop your instrument. Excessive force may cause whiplash that may crack the neck or headstock of your instrument. When bringing out the instrument outside your case, place the case first on the floor before you take out your instrument. It is recommended that you carry your instrument at the middle of the neck when you are bringing your instrument outside the case. This will make you spatially aware that may prevent accidental bumps and dings. In case you are carrying your guitar using a backpack case, be mindful of vertical clearances such as door openings and ceilings. When playing the instrument, be mindful of long necklaces, belt buckles, buttons, or any hard material that may scratch or dent the finish the back of your instrument. Be mindful of your surroundings to prevent accidental bumps. If you are using a strap, make sure that the strap is completely fastened to the strap pins. Before carrying your case or bag, make sure that the latches are fastened / the zipper is completely zipped. In case you need to store accessories in your case with your instrument, make sure that you place it in the compartment areas and pockets. Loose objects may scratch your instrument while in transport. Do not store your instrument in a place with extreme temperatures. Do not store your instrument near wet areas such as bathroom, lavatories, and pipings. Do not store your instrument near windows or openings that may introduce moisture. Do not store your instrument under direct sunlight. You can opt to hang your instrument using properly installed guitar / ukulele hangers. If you need to place your instrument on a stand, use a stand that has neck support and make sure that it will not be an obstruction to walkways. Use stands that are stable enough and are not easily toppled. It is recommended that you keep your instrument inside a case if you will not use the instrument for an extended period of time. Even if it is inside the case, the instrument may not be able to withstand a strong impact in case of an accidental drop and falls. It is best to store the case horizontally to lessen impact due to drops and falls. The guitar and ukulele probably travels more than any other musical instrument and it will only be a matter of time before you take yours on its first trip. If you are going to take your instrument on the road with you, remember that it is not just another piece of baggage. You have to make an effort to ensure its safety. Keep your instrument inside the case or bag while transporting. We recommend that you use a hard case to transport your instrument. For convenience during shorter travels, you can consider using a padded bag or a foam case. If your instrument did not come in one, you can purchase a Maestro Premium Gig Bag at shop.maestroguitars.com or through a Maestro Dealer near you. When you are using a padded bag, be watchful of your surroundings, especially while walking/riding the bike to avoid knocking your instrument. If you are slinging your instrument on your back, be cautious of low ceiling to avoid knocking the protruding headstock. Avoid placing any loose objects inside the case that might scratch or dent the instrument. For hardcases, place those items in the compartment. If you are using a padded bag, place the accessories in the outside pocket except sharp objects that may scratch or dent the instrument. We recommend always resting your instrument horizontally, even if it is inside a hardcase. Resting it vertically will increase the force of the impact on instrument when it accidentally falls down. If you are travelling by car, avoid placing it in the trunk as much as possible. It is much safer in the back seat for most car trunks are neither heated nor ventilated which may extreme changes in temperature. Prolonged exposure to extreme temperature may cause the wood in your instrument to crack or warp. Subjecting you instrument to excessive heat may cause the glue adhesion to melt and become ineffective. When you are travelling by air with your instrument, extra caution and protection is required to ensure your instrument’s safety. Airlines do not set out to damage your instrument intentionally, but a conveyor system can’t tell an instrument from the other baggages. Airlines may consider a guitar to be too fragile for their handling and may require you to accomplish a waiver which limits or remove their liability. 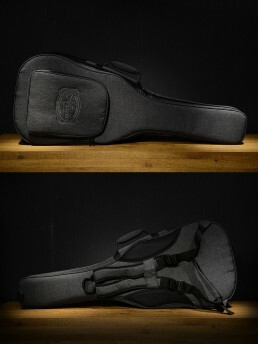 Even a hard case can’t always protect a guitar from damage caused by mishandling of individuals or commercial carriers. Occasionally, you can bypass the usual baggage handling system by asking to carry your instrument to the boarding area where it will be tagged and hand carried to the airplane. Upon arrival, you can ask the flight attend if it will be possible to retrieve your instrument at the gate rather than collecting it from the conveyor belt. Do take note that not all airlines give you this option. Loosen the strings to reduce the tension on the neck but not completely releasing the tensional pull of the strings as there is a chance that the neck angle may be affected. Loosening the string tension will prevent damage caused by a whiplash in case the instrument is dropped. Pack your instrument in a hard case that is a perfect fit. Make sure that the instrument is secured tightly in the case by using a soft cotton or foam to secure the gaps. Keeping the instrument tight in the case decreases the possibility of damage due to unnecessary movements while the instrument is in transit. Do keep in mind that no matter how good the hard case is, it may not protect your instrument from careless handling or accidents. If available, you can send send your instrument to be checked in to a wrapping service usually available in airports. The plastic cover will protect the hard case and at the same time lessen the effects of sudden changes in humidity. Check your instrument as soon as you retrieve your instrument from the baggage area. If you see any signs of damage due to mishandling or accidents, immediately report to the airport personnel.